In the mid-1990s, home run production increased dramatically. Many news stories, congressional hearings and water cooler conversations have tied this increase to the use of steroids and other drugs. However, science does not support this conclusion and there are many possible reasons for the increase in the home run production rate at the end of the 20th century. 1) The 1990s saw a surge of ballpark construction, with most of these new parks favoring hitters. These new fields are not physically smaller but in most cases play smaller. This is due to the fact that parks partially open in the outfield replaced multi-purpose, enclosed stadiums. The latter allow wind currents to carry the ball further into the outfield and over the fence, thus adding to the home run totals. 2) Through the years, the strike zone called in games has decreased in size, getting lower and wider. Since a letter-high fastball is generally harder to hit than one below the belt, this change in the zone has helped hitters. 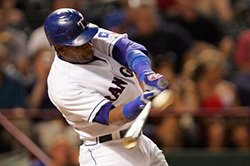 3) Multiple technological benefits for sluggers have appeared in recent years. One of these is the increased use of video to improve training. 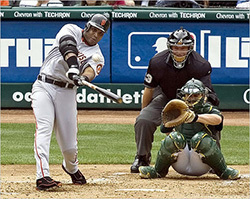 Players can watch their previous at-bat at bat during a game in the clubhouse to improve their chances against the same pitcher later in the game. 4) Another improvement is the use of maple wood for bats instead of the traditional ash. Maple is a denser and heavier wood than ash and, because of that increase in density; maple bats are slightly smaller in diameter than ash. The smaller barrel diameter might cause slightly more backspin on the ball, which would result in longer distance on a fly ball. 5) Today’s players are products of a better youth environment. Advances in science have caused an increase in the quality of the nutritional value of food consumed in the latter half of the 20th century. Better nutrition at an earlier age stimulates muscle development and overall growth in a child, the most important period for physical development. Good nutrition also translates into healthier adults who suffer fewer injuries and heal faster, both important factors for athletes. 6) Young adults coming into the game in the 1990s are products of a different sports environment than that experienced by previous generations. Today’s youth sports are better organized, better equipped, and use better training techniques. Some of this is a result of simply being organized at all, as many kids primarily played pick-up games in the past and today’s youngsters spend most of their sports time in organized leagues. This training at an earlier age helps develop better skills in more players and creates a larger pool of gifted athletes from which to draw. In addition to having better skills (including hitting mechanics), this new generation of hitters trains to hit for power rather than for average. 10) A larger pool of people from which to draw talent due to the increase in scouting in the Caribbean. It is clear that many factors have contributed to the increase in home run production in the last ten years. 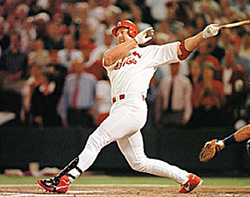 However, hitting a four-bagger is still the hardest skill in the sports world. It should be celebrated not denigrated. SABR member David Vincent, the “Sultan of Swat Stats,” is the recognized authority on the history of the home run. He is the author of Home Run: The Definitive History of Baseball’s Ultimate Weapon, published by Potomac Books, Inc.